Funeral Mountains. Starvation Canyon. Deadman Pass. The names are not subtle, as Death Valley is not a hospitable place. Hottest, driest, lowest–it is a land of extremes. 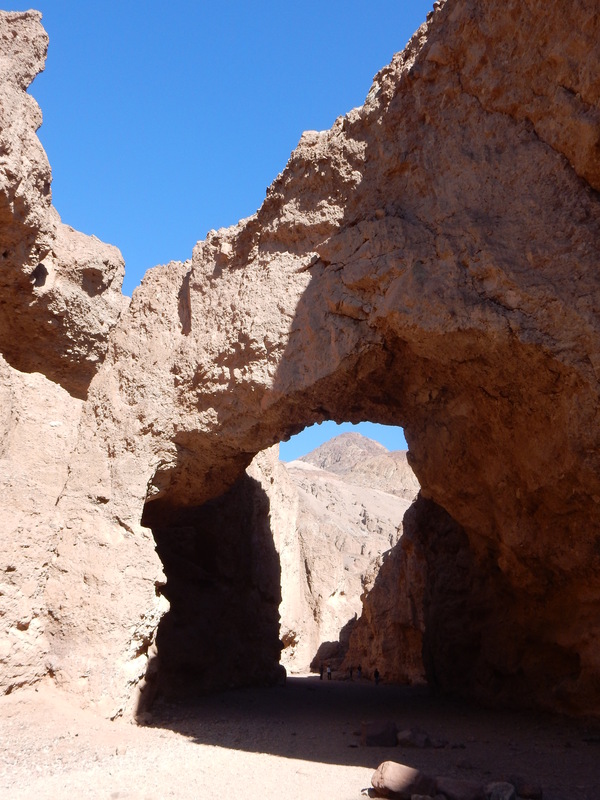 In July 1913, the highest temperature ever recorded anywhere, 134 degrees, was reached at Furnace Creek. Daytime summer temperatures of 120 or greater are common. On summer nights, the temps cool down to the nineties. I chose to enter it in the dead of winter. The valley was named by a group of Gold-Rush speculators who got lost while attempting a shortcut to the mining fields. 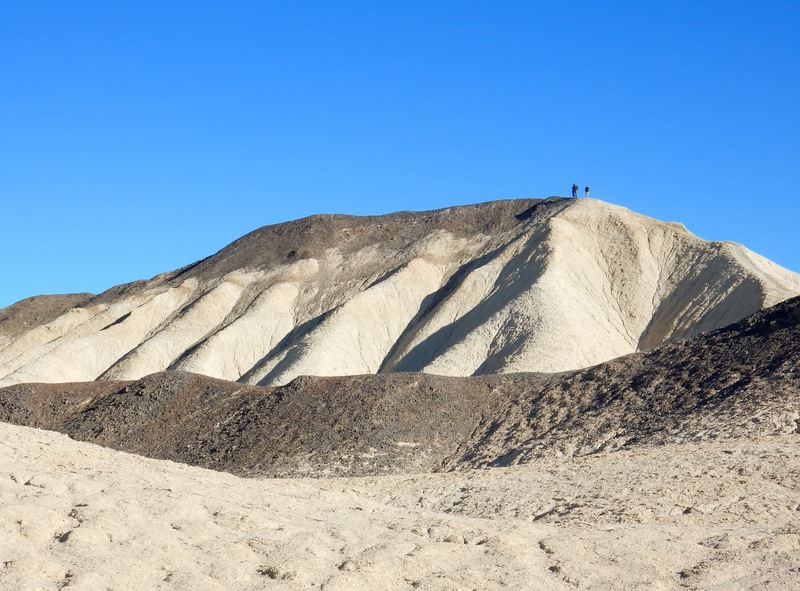 After facing numerous topographical obstacles, the so-called Lost ’49ers arrived near Furnace Creek. In treacherous terrain, the miners’ covered wagons were of no further use. Some walked out. Some waited for help. Eventually, all but one escaped the valley alive. The term resort, as used in Death Valley National Park, means a lodge with cabins, a full-service camp site, a restaurant, a general store and maybe a pool. There are three of these oases in the park, each under a canopy of imported palm trees. 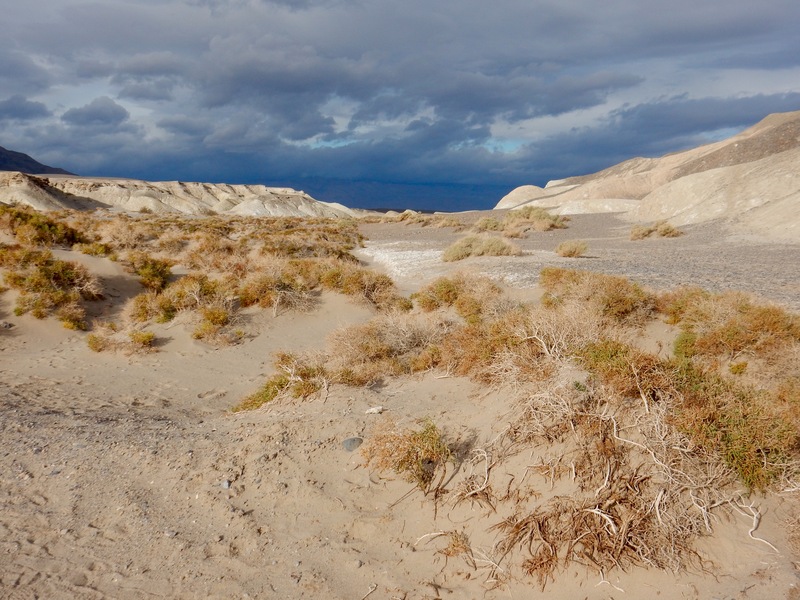 One is Stovepipe Wells, named after a life-giving spring at the junction of two Native-American trails. The location was difficult to find in the shifting sand dunes, so early miners marked the well with a length of stovepipe, giving the area its name. In 1925 a hotel was built at Stovepipe Wells to accommodate adventuresome sightseers. The nearby Mesquite Flat Sand Dunes still attract tourists, who abandon their cars along the side of the road and head off into the desert. In places, wind has swept the sand away and exposed the ancient cracked-clay lakebed. 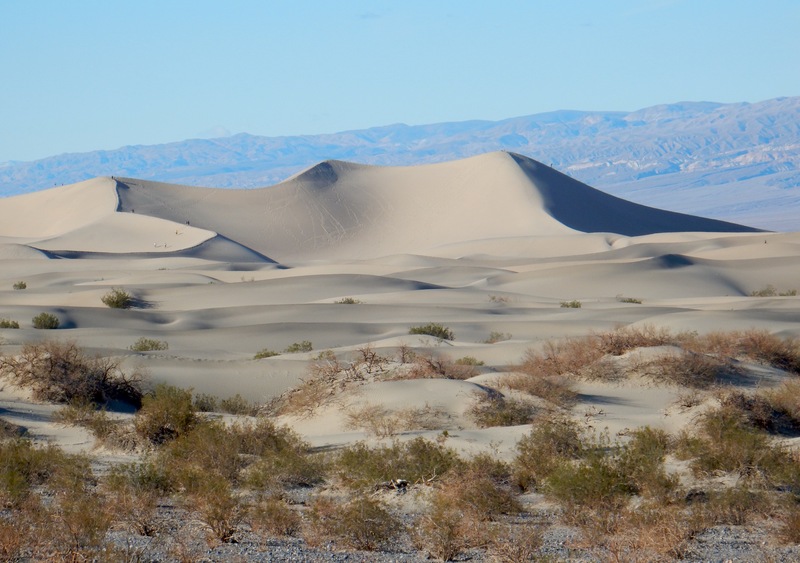 The dunes and other locations within Death Valley have been used as settings in hundreds of movies, including episodes of Star Wars, Spartacus and numerous westerns. Today, Stovepipe and the other resorts attract an electic mix of visitors–campers in fleece, hikers in plaid, cyclists in Lycra, birders in khaki and bikers in leather–all of whom gather in the watering holes at the end of the day. I checked into Stovepipe and, like the early pioneers, suffered with slow Wi-Fi and a lukewarm shower. At 3.4 million acres, Death Valley is the largest national park and largest designated wilderness area in the contiguous forty-eight states. Although Stovepipe is centrally located, every site of interest is at least a one- or two-hour drive away. But I didn’t mind. The scenery is colorful and mesmerizing, a diverse environment of mountains, valleys, canyons, badlands, salt flats, sand dunes and even a volcanic crater. I explored in a different direction each day. First was south. I was up early, the only one in the Wild West-themed dining room among the steer skulls, wagon wheels and branding irons. Outside, some Wild Hogs grilled their breakfast, as huge crows panhandled. The valley was filled with haze, a white sandstorm. Sand blew in rivulets across the road. I passed a man, alone on the desert highway, riding an elliptical bike. In a few miles I turned onto a washboard gravel road and arrived at the Salt Creek trailhead, a short boardwalk loop over a briny creek. Salt Creek runs two-hundred feet below sea level. At 8 a.m. I was alone on the trail. Absolute stillness, except for the gurgling of the brook in the desert. Saltgrass and pickleweed grow in the marsh. And, incredibly, so do fish. The salty water is the habitat of the Salt Creek pupfish, a species found nowhere else. I was contemplating a pupfish dinner, when I read that some pupfish species are endangered. Plus, pupfish are only an inch long, which may explain why I didn’t see any. They must be tough little guppies to survive both high temperatures and high salinity. When gold and silver were discovered in the valley in the late 1800s, several mining towns boomed. However, the only ore to be profitable was borax. Borax was used as an ingredient in numerous products, including detergents, cosmetics and insecticides. The operations center for the Pacific Coast Borax Company was Furnace Creek, now a resort. Pacific Coast’s brands included 20-Mule-Team laundry soap and Boraxo powdered hand soap. Pacific Coast sponsored Death Valley Days on radio, starting in 1930, and on TV, beginning in 1952. I remember watching in the mid-1960s when Ronald Reagan was the show’s host. I toured the small Borax Museum, housed in an 1883 miners’ bunkhouse. 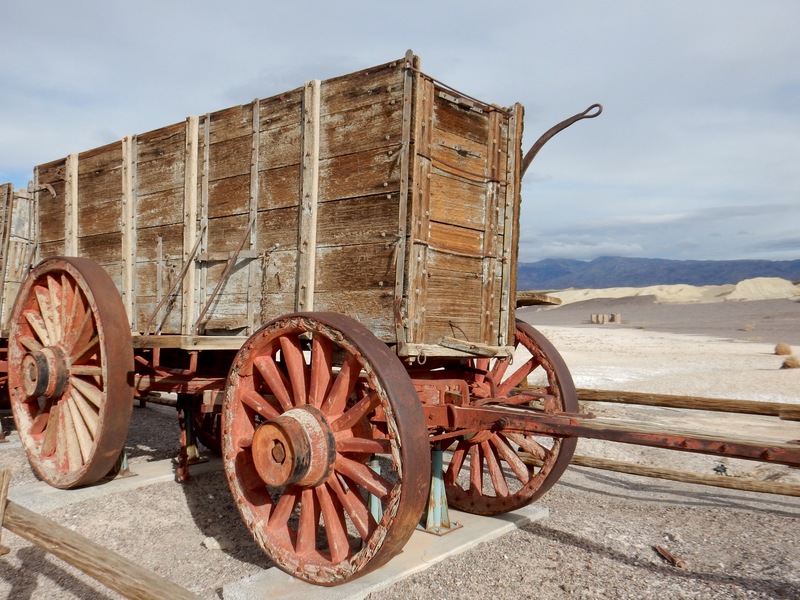 In its yard is a collection of mining equipment, stagecoaches and buckboards. Outside of town, I visited the remains of the Harmony Borax Works. At the site, Chinese laborers were paid as little as $1.30 per day to scrape borax from the surface of the salt flats. The Harmony operation was famous for its use of twenty-mule teams (eighteen mules and two horses) to haul refined borax out of the desert. The teams could pull up to thirty-six tons over 165 difficult miles. All that is left of the camp today is rusting machinery and stone foundations. Furnace Creek is also home to the Timbisha reservation. The Timbisha have inhabited the Furnace Creek area since around 1000 CE, although they were preceded by earlier tribes as far back as 7000 BCE. After lobbying for decades to claim their homeland, the Timbisha, in 2000, became the first Native Americans to secure land rights within a national park. The next day I headed south again, descending further into the valley. 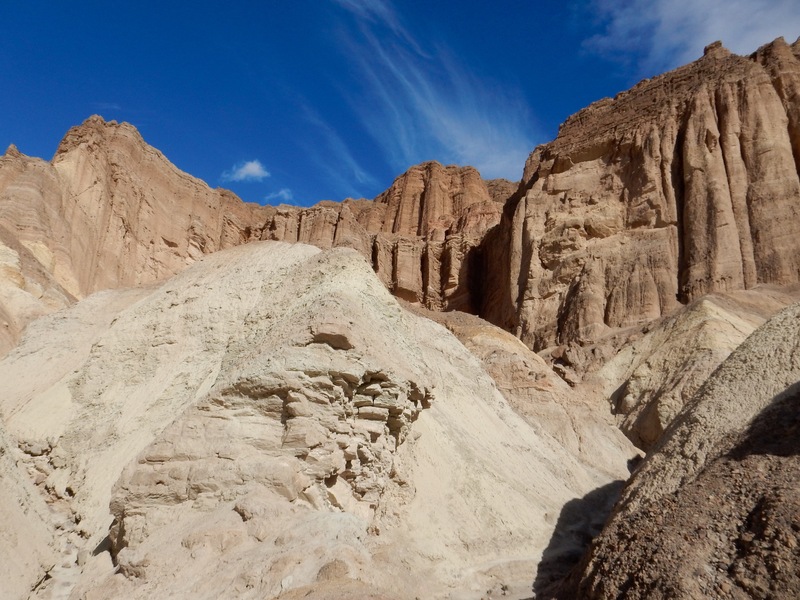 Despite its name, Death Valley National Park is not one valley, but several, alternating with mountain ranges. Sometimes the barren mountains resemble cloth, draped or pleated. Other times, crumpled paper. Along the way, yellow tumbleweeds gathered at the edges of the road. 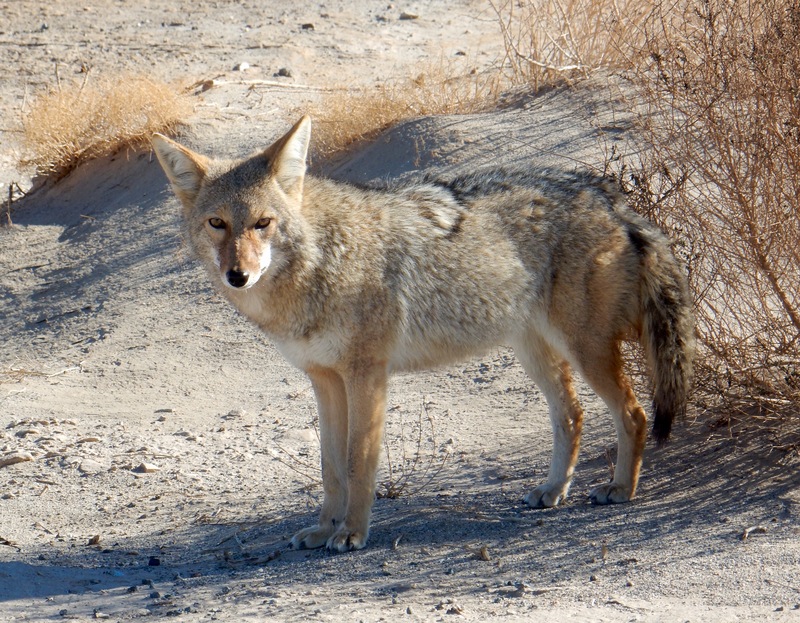 A lone coyote trotted through the moonscape. For long stretches, I was alone on the desert highway. No one in front or behind for many miles. And in the park, there are few signs of humanity. No houses. No telephone poles. No mobile-phone coverage. While traveling, I have experienced both loneliness and aloneness. Aloneness can be unsettling and calming at the same time. I hiked the winding Golden Canyon trail. The canyon stands in for Jawa Canyon in Star Wars (the original episode). The rewards at the end are the magnificent Red Cathedral cliffs and the Manly Beacon. 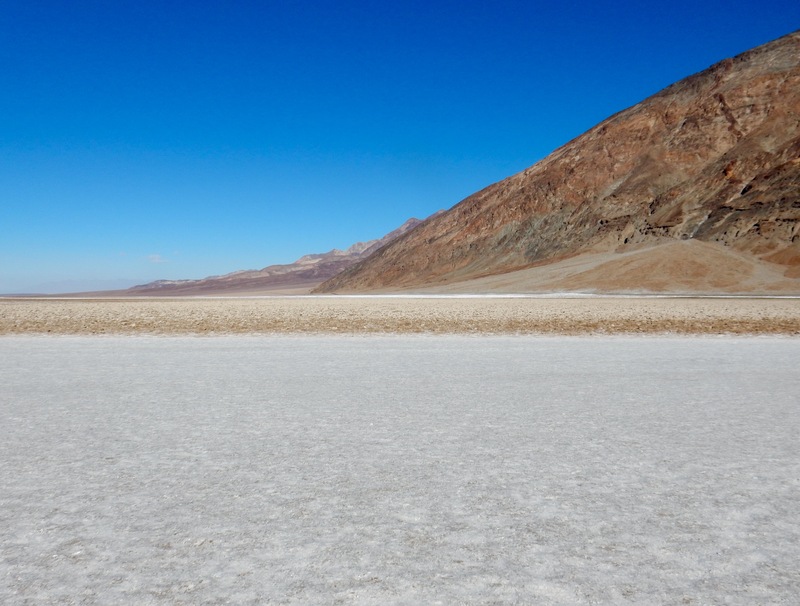 Then down, down, down to Badwater Basin, an endless flat, white plain in the valley. Badwater is 282 feet below sea level, the lowest point in North America. A sign indicating the location of sea level is posted on the cliff face, a football-field high. The ground appears to be powdered with snow, but it is salt. I walked out onto the pan, the mushy salt crystals caking my shoes. In spots, water seeps through. The crust is between one- and five-feet deep, the water four times saltier than the ocean. Quiet and alien. Nearby, I stopped at the Devil’s Golf Course, an evaporating salt pan as wide as a sea. Here, the salt forms into jagged clumps as hard and sharp as coral, erupting from the floor in pinnacles. Mountains of volcanic cinders, fields of gravel, no trees, little vegetation. Seemed like I was confined to the inside of a charcoal grill. The drive west was a white-knuckler, first a 9 percent climb from sea level to nearly five-thousand feet and then a steep dive into Panamint Valley. At the bottom, two coyotes watched me pass. Drove on to Father Crowley Vista, an even steeper and more serpentine ascent, where I looked out over Rainbow Canyon. Windy and cold at the top. The view seemed infinite, miles up and down the Panamint Valley, mountains marbled in pastels of red, yellow, orange, green and brown. A fighter from a nearby military base zoomed through the canyon below where I was standing! Inside the canyon, the walls are curvy and narrow, barely wide enough to walk between, and lined with polished marble. Real marble. Further on, the canyon opens. Huge chunks of rock thrust and shatter in every direction, a geologist’s dream of colors and textures. Toward the end of the trail, the canyon narrows again and presents several rock scrambles. I climbed them all and arrived at the end, where the only way out was vertical. I was back in Stovepipe by sundown. The saloon was crowded with a tour group of nature photographers. Outside, an astronomer set up his telescope. Death Valley is designated a Dark Sky Park. Zabriskie Point was the name of a 1970 cult film. Some of its scenes were shot on location in the valley. The soundtrack featured music by Pink Floyd, the Grateful Dead and the Stones. 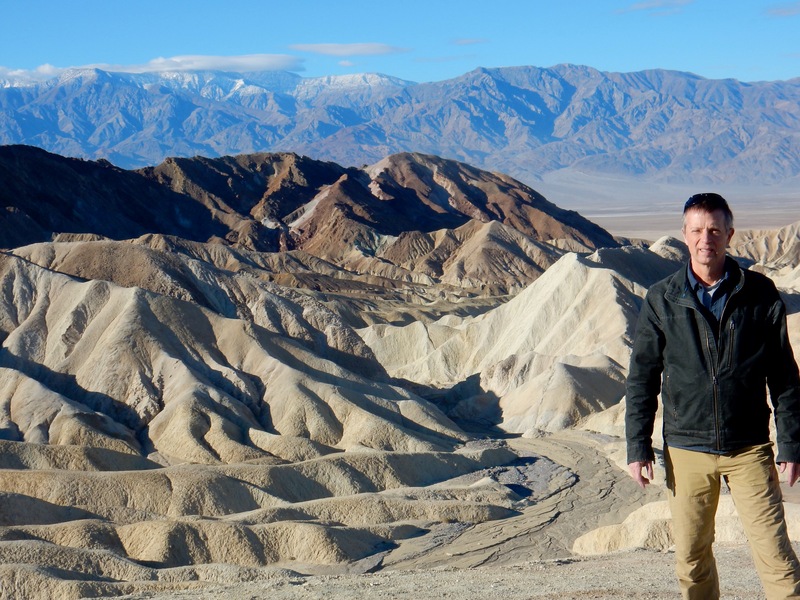 The real Zabriskie Point was breathtaking, a spectacular view across yellow and red mounds of rock, eroded into gullies. It presented a different angle on Manly Beacon and Red Cathedral. Upon leaving, I drove the delightful, surreal Twenty-Mule-Team Canyon, a single-lane one-way ravine through narrow slots and multicolored badlands. Onward to Dante’s View, with the 15 percent grade to the top and the jaw-dropping panoramic look to the valley floor. Dante’s View is just over a mile high. On clear days, the highest and lowest points in the contiguous forty-eight states can be seen: the Sierra Nevadas, including a not-quite visible Mount Whitney at 14,505-feet high, and Badwater Basin at -282-feet low. Across the valley is the Panamint Range, topped with snow. 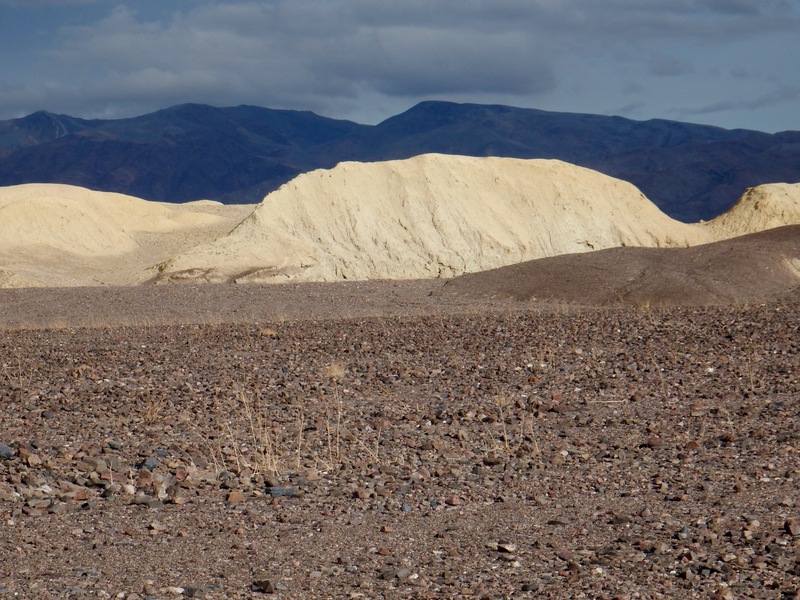 Death Valley is the driest place in North America. Average rainfall is less than two inches per year. In some years, zero rain falls. However, in October 2015, nearly three inches fell at once. The hard ground couldn’t absorb it. As a result, the water, channeled through canyons and gulleys, formed powerful flash floods. Three park rangers and seventeen visitors were stranded overnight at Ubehebe Crater. Scotty’s Castle was severely damaged. Walter Scott, aka Death Valley Scotty, claimed to have built his “castle” with profits from his gold mine. He notoriously conned wealthy businessmen into investing in his mine, then enjoyed extravagant spending sprees in New York City and Los Angeles. He is fondly remembered in the valley as a loveable “character.” Scotty’s Castle became a hotel in the 1930s and was, until the flood, a top attraction. It is scheduled to reopen in 2019. The ghost town of Rhyolite is named after an igneous rock. It was founded in 1905 after gold was discovered nearby in an area called the Bullfrog Mining District. During the ensuing rush, thousands of prospectors descended upon Rhyolite. Industrialist Charles Schwab (no relation to the broker) bought the mine in 1906 and invested in the boomtown’s infrastructure. By 1907, Rhyolite had fifty saloons, thirty-five casinos, nineteen hotels, eight doctors, six barbers, three banks, two churches, two undertakers, a hospital, a school, an opera house, a bathhouse, a stock exchange and countless brothels. The town’s population peaked at around five-thousand. 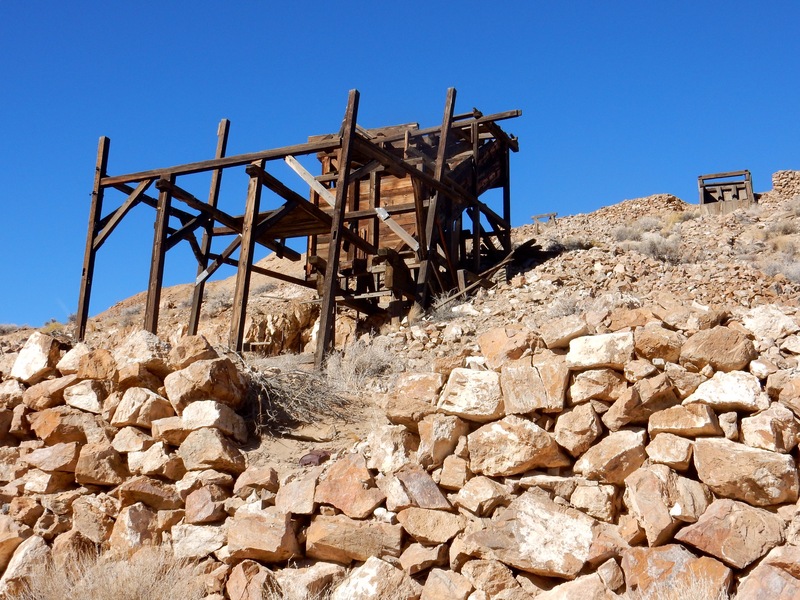 The mine closed in 1911 and Rhyolite declined as quickly as it rose. By 1920, the town’s population was near zero. 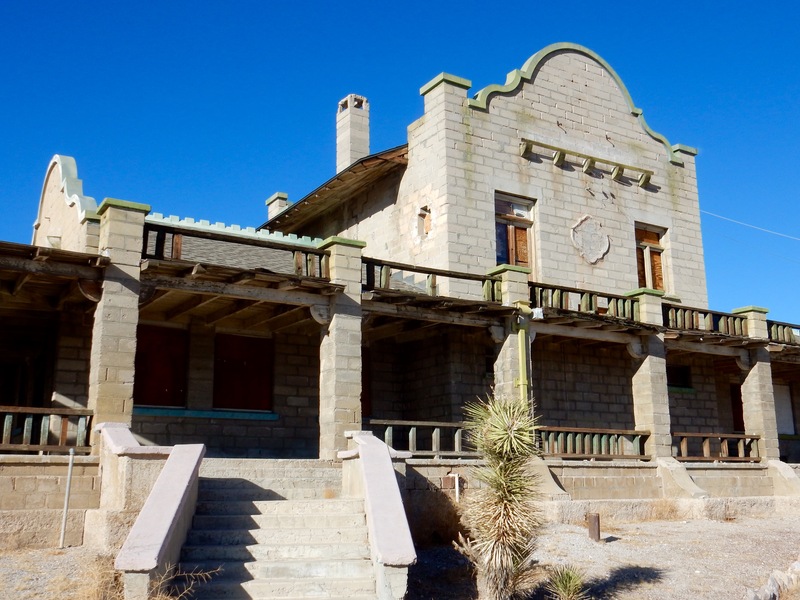 Now, most of Rhyolite’s buildings are ruins, although the Las Vegas & Tonopah Railway Depot and, for some reason, a house constructed of empty beer bottles have been preserved. Next morning, a translucent moon hung above the valley floor. Smoke from cookfires joined the desert haze. I headed southwest on Emigrant Canyon Road, stopping to take photos of the snow-capped Panamint range. The climb and descent from mile-high Emigrant Pass were nail-biters. A steep, winding road with numerous blind curves and no guardrails. Thought I might end up like Thelma and Louise. Piles of fresh dung on the road. Finally, I spotted one, a wild desert burro, likely descended from a prospector’s helper. Also a couple of cottontails. I drove the three-mile rock-strewn road to the Wildrose Charcoal Kilns slowly so as not to damage the rental car. The last half of a mile was covered in snow, which softened the jarring. The kilns look otherworldly, like Stone-Age spaceships. Ten of them in a row, twenty-five-feet high and thirty feet in diameter. 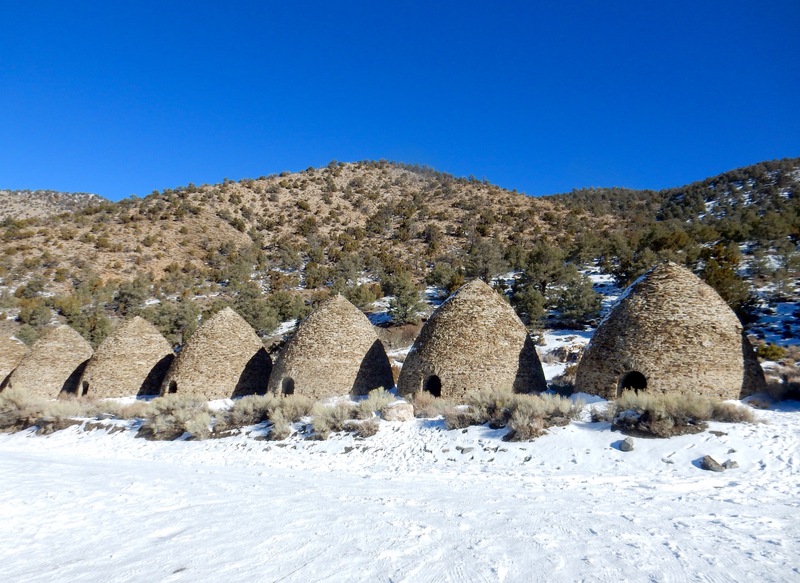 They were built in 1877 to produce charcoal for use in extracting silver and lead from ore.
Workers fired them with pinyon pine and juniper. The process of burning and cooling took nearly two weeks. The finished product was transported to the smelter by pack strings of burros. I traipsed around in the snow, examining them. Some hikers passed, on their way to Wildrose Peak (9,064 feet). Another trail leads to Telescope Peak (11,049 feet). Another unpaved road led to the abandoned Eureka Mine, where gold was discovered in 1905. I climbed around the site, examining the old mining equipment. The mineshaft itself was closed to protect its colony of hibernating big-eared Townsend bats. On the other side of the hill, I visited the Harrisburg mining camp, now a ghost town. Pete Aguereberry, a French Basque, spent nearly forty years living at the camp and working his claim. The camp grew to support a population of three-hundred. Aguereberrry’s two-room cabin still stands, now vandalized. Old appliances and rusty bedsprings are scattered around the yard. 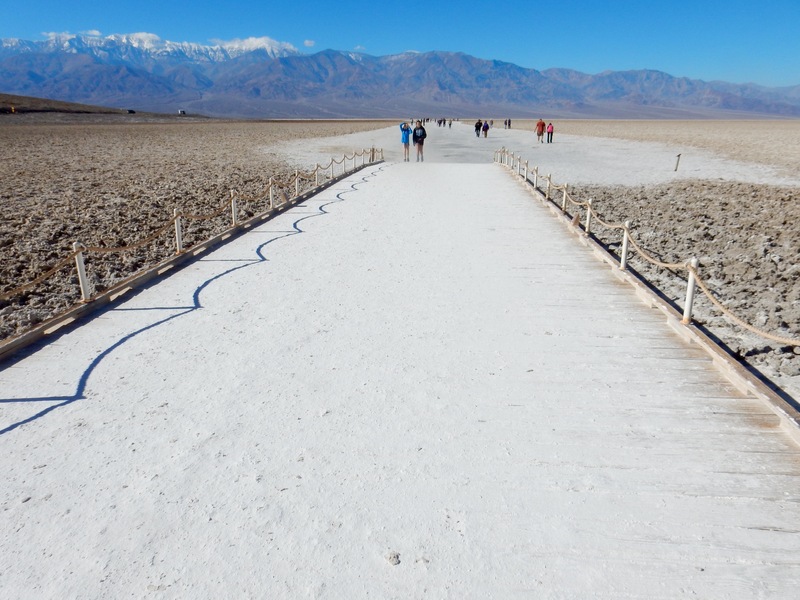 The “world’s toughest footrace,” the Badwater Ultramarathon, starts in Badwater Basin. It is a 135-mile course through Death Valley, ending at Whitney Portal, the trailhead to Mount Whitney, with thirteen-thousand feet of cumulative elevation gain. It takes place annually in mid-July, when temperatures can reach over 120 degrees. The field is invitation-only and limited in size. Support is not provided. Each runner must arrange for his or her own crew to provide water, food, gear, pacing and first aid. Runners are allowed forty-eight hours to complete the course. Over seventy people compete each year. None have yet died, but almost half fail to finish. Love this post……so amazing to hear these stories!!! Kirk, what an outstanding blog of your visit. Ervin and I are adding it to our bucket list. So interesting. Such varied terrain. Really enjoyed your commentary. Thanks, Kay. I really enjoyed it. Will probably go back. I highly recommend Joshua Tree NP as well. Great post, Kirk. As I read the details of your trip I couldn’t help but wonder what would happen if your car broke down in one of these remote areas where cell phones do not exist? Anyway it was fascinating to read about your experience thus far. Stunning photos! The text made me a little concerned for your safety. I remember that very lonely feeling when I drove across Death Valley but certainly didn’t explore the areas that you did. Very interesting. To say you have been getting about a bit, since we met with the deer in West of Scotland, is an understatement. Wonderful pictures surrounded by superb descriptions of what is, undoubtedly, an amazing place to visit. Don’t think we’ll ever make it out there but great to read about Death Valley. Thanks Kirk. Thanks, Anne. As always, great to hear from you. Kirk, as always, I enjoy living vicariously through your posts. I hope you’re doing well. What’s next on the list of places to go. Thanks, Bill. I continued southward through Mojave and Joshua Tree. Will write about them soon. Heckman recently joined me in southern Arizona to tour Organ Pipe Cactus National Park. Working my way into New Mexico tomorrow and continuing to avoid winter.